It looks like we'll have to wait at least another week to see the threat level under the dome escalate beyond "I miss texting." In its third episode, the series continues to expend energy and screen time on the least interesting implications of its central dilemma, and it threatens to settle into a "mini-crisis of the week" formula that takes very little advantage of the show's premise (not to mention its source material). As day three arrives, there is little concern, let alone panic, among most of the residents of Chester's Mill. Presumably there are still representatives of various government agencies studying the dome from outside, but we don't see them at all this week. Maybe they saw what was going on inside, got bored, and went home. The only person who makes any attempt at escape this week is our friend Junior, at the urging of Angie, who is starting to look like one of the smartest people in town. Too bad she's still confined to the bomb shelter. Still, the interaction between Big Jim and Barbie is probably the most interesting aspect of this week's episode. They're circling each other and sizing each other up, and it's possible they're connected in some way yet to be revealed (maybe even to them). Their scenes are certainly more effective than those between Big Jim and Junior this week. It may just be because they're so physically different, but I'm having a hard time buying Norris and Koch as father and son. What really sank this episode for me, however, was the teen phone-charging drama going down at Joe's place and the accompanying budding romance between Joe and Norrie. I suppose it makes sense that kids would still be in denial about the seriousness of their predicament and treating the dome as an excuse for a never-ending party with no concern for future consequences. But the writing is particularly weak when it comes to these younger characters, especially when they speak in would-be hip Millennial lingo that sounds at least a decade out of date. And why is it that Joe still hasn't noticed that Angie is missing? I'm not giving up hope yet, but it already feels like Vaughan, Baer, and company have squandered much of the pilot's potential. 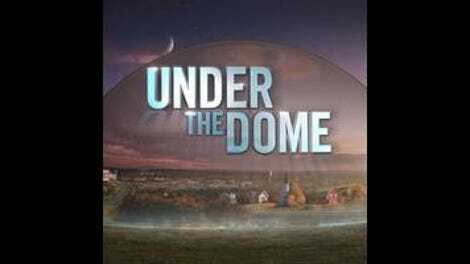 It's understandable in a way: If they want to keep the dome up and running for seasons to come, they can't let things go to hell too quickly inside of it. But these mini-crises like the fire and the manhunt can't help but feel like delaying tactics, put in place to prevent the characters from reacting to their situation in a more direct, concrete manner. Food, water, and fuel are all going to run out, and nobody seems to care. No one is even trying to contact the outside world anymore. (How about holding a sign up?) If we're expected to invest in the plight of these characters, it's only fair that they do the same. It only took three episodes for someone to make the connection with The Simpsons Movie. It had to be done, I guess. Phil Bushey has finally come around to the idea that occasional news updates are a good thing. Baby steps. Speaking of Chester's Mill's favorite DJ, is there a reason Barbie didn't want to meet him? I mean, an interesting reason? If so, I hope we'll find out soon. "It's a small town, son, and we all support the team" is a line from a James McMurtry song, and also just about the only thing in this episode that's straight out of the Stephen King book.